"if you don't like it, change it or deal with it." you can leave a request if you don't mind waiting forever for it. Please read the RULES below before making a request. just replace the word SOMETHING to something you are looking for. here is a list of users who are waiting for their graphic(s) to be worked on. if your name isn't on the queue list maybe because you didn't read my rules, you didn't fully explain your request, and/or your on the good list or the poo list. it's not late to change your request, only if the status is waiting to be worked on. This is a list of graphics for you to click on to leave a COMMENT and a RATING. You have 14 DAYS to do so or you will go on the POO LIST. for the photobucket websites, PLEASE leave a comment on the photobucket site. This is a list of graphics that needs COMMENTS and RATINGS. Click on your name to do so. then I will take you off the list. no request till done so, SORRY. for the photobucket websites, PLEASE leave a comment on that site. 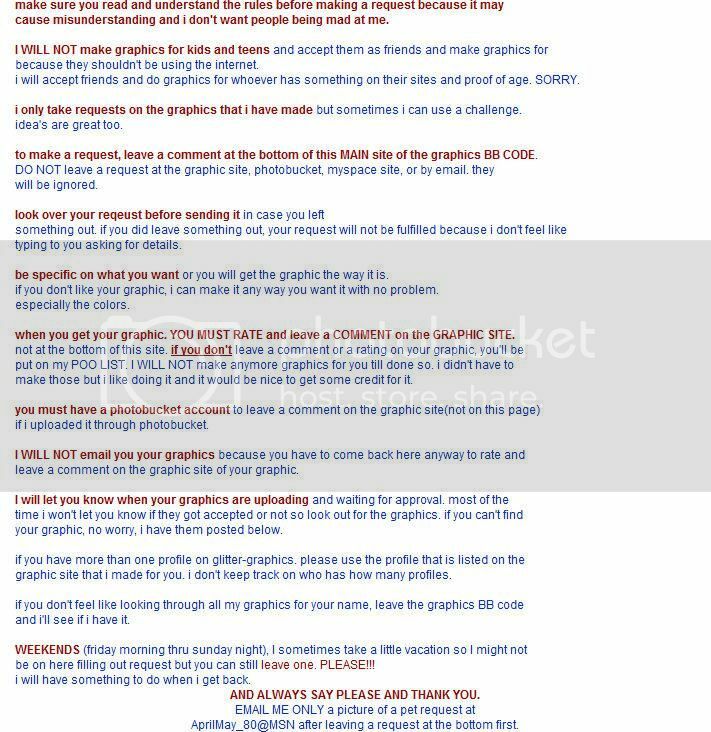 maybe other users won't make graphics for you either. to know more about me, go to myspace because there isn't enough room here. 4. How to change the font, color, and/or size of the text on the site. so i can vote and leave comments on them if i like them. Login or register to add April May as your friend! thanks so much for stoping by my page. yay its finally the weekend and i can get caught up on my house work..lol anyways i hope you have a awesome weekend!